Likewise all Microgaming slots Gold Factory presents colorful and joyful design, pleasant soothing music and sound effects. The slots has 50 lines 5 reels, it awards high fixed jackpots, interesting Bonus Games, Free Spins, wild symbol and high scatter payouts. Much of gold bars and coins can be found of the reels of this elegant slots. Spinning the reels will go smoother and more exciting when you realize that the first Top Jackpot constitutes 150,000 coins and can be awarded once you trigger 5 wilds on an active payline. Gold Factory Logo is your lucky wild symbol. 5 logos bring you the first Top Jackpot which seems pretty shocking – 150,000 coins or $15,000. Gold Factory Logo substitutes for any symbol to create a winning combination except scattered Golden Coin. Keep an eye on that Logo and make Golden Factory work and earn you lots of money. Golden Coin is a scattered symbol but at the same time it awards you numerous bonus games. Golden Coin brings large multipliers. Thus, triggering 5 Golden Coins will bring you 200,000x Multiplier! 4, 3 and 2 Golden Coins award you 20,000x, 3,000x and 2,000x Multipliers respectively. Gold Factory offers really high jackpots. The Top Jackpot constitutes 150,000 coins or $15,000 for five Gold Factory Logos, the second Top Jackpot is not less impressive and counts 50,000 coins or $5,000. However you should not forget that you can win Top Jackpots only in case you opt for the maximum coin denomination. Gold Factory offers many coins with different denominations. You can select any of them ranged between $0.01 and $0.10. Gold Factory is a penny slot and provides you with the minimum total bet of 50 coins which means $0.50 if you play with the minimum coin size of $0.01. Of course you have an option to stake up to 20 coins per line and if you go for the highest line bet, the maximum total bet per spin will constitute 1000 coins which means $100 if you opt the maximum coin size of $0.10. 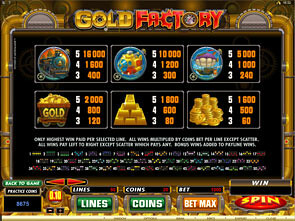 As you see Gold Factory slots has a very flexible range of wagers so every player can chose the best bet size. And since scatters offer large bet multipliers you will maximally benefit from them if you stake the maximum total bet. The more we learn about the slots the more we love it! Triggering 3 or more scatters grands a perfect opportunity to participate in a Boiler Room Bonus Game which gives you a chance to win up to 619,000 coins! Entering Boiler Room Bonus Game you appear in the center of the main action, you see a boiler that produces gold bars. On the screen you can notice 12 containers and some of them include hidden prizes. You have 4 attempts to reveal your prizes or to enter the second level of your bonus game. The 2nd level can be entered once you find one of 2 important coins in those containers: Free Spins coin and Reactor Bonus coin. If you find Free Spins coin you are awarded 10 to 30 Free Spins and all your wins for the spins will be doubled. This feature will definitely make you rich. Once you find a Reactor coin you will start your Reactor Bonus Feature which awards you up to 10 random bonus amounts. On the second screen you will see 12 chambers. Ten of them contain randomly assigned bonus amounts and the rest two hide Malfunction symbol which finishes the Reactor Bonus Feature once revealed. You will get a consolation prize of 1x Multiplier of your total bet for every unrevealed bonus prize. All your wins during Reactor Bonus Feature will be multiplied by your total bet. 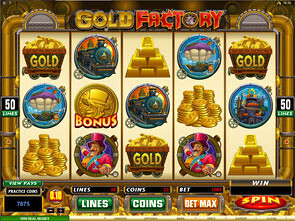 Gold Factory is your lucky choice on the way to high winnings and successful and pleasant gambling. The slots which features numerous bonuses, high jackpots and large scatter payouts will definitely satisfy your thirst for exciting and highly rewarding slots gaming experience.